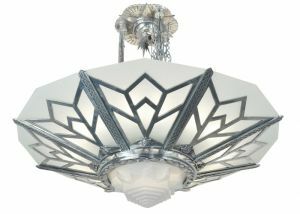 Outstanding, large commercial chandelier. 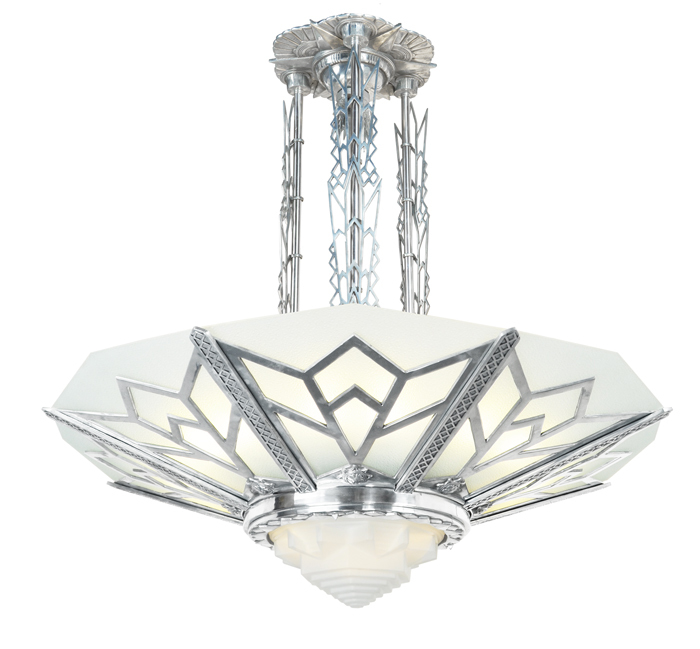 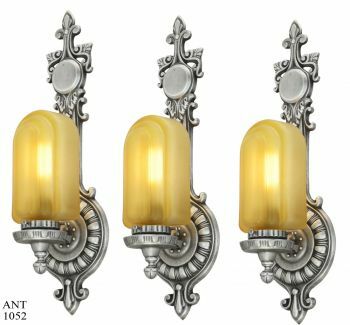 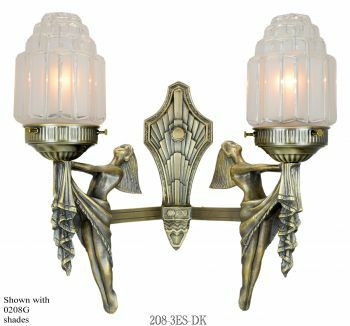 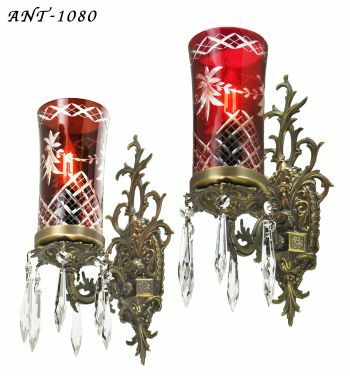 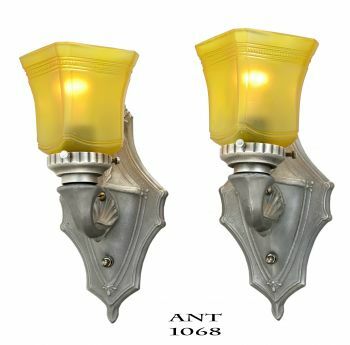 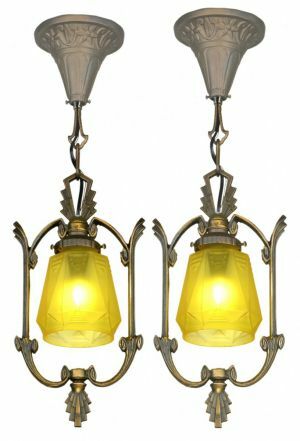 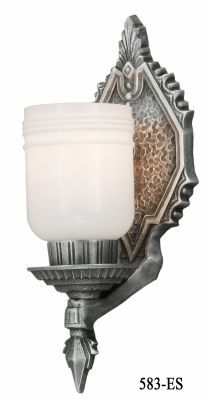 Top of the line from our Manhattan Series, which includes smaller chandeliers and matching sconces. 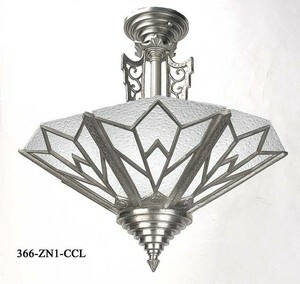 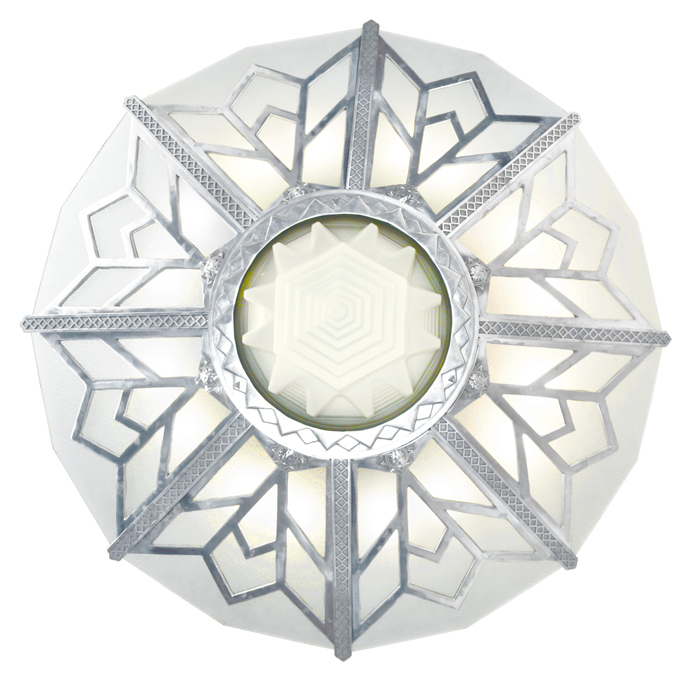 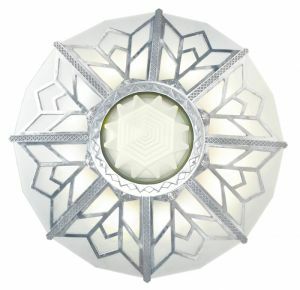 Usually the first question is size: this chandelier has a great 46 ½"
" drop. 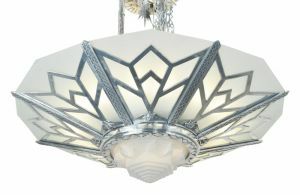 The drop has been defined by the decorated sections on each upright. 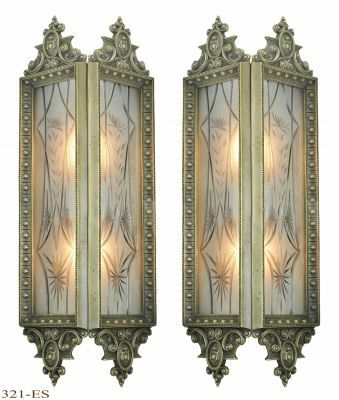 Decorated sections are each a foot in length...therefore...we could shorten (or lengthen) easily by even increments of those décor panels. 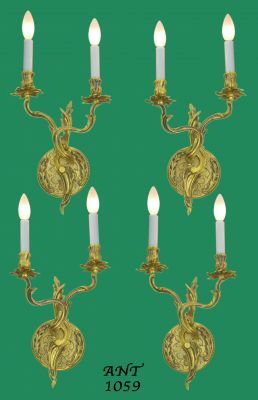 This is not a limitation, as other lengths can be achieved...only a convenience.
. 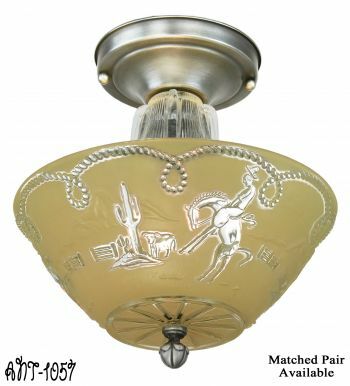 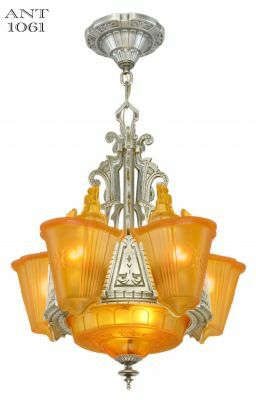 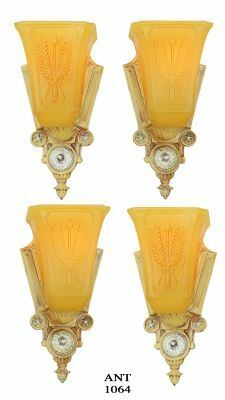 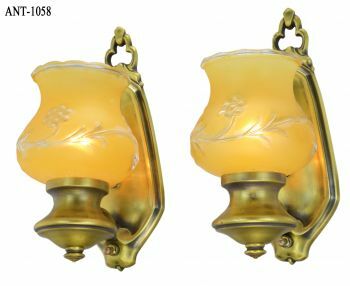 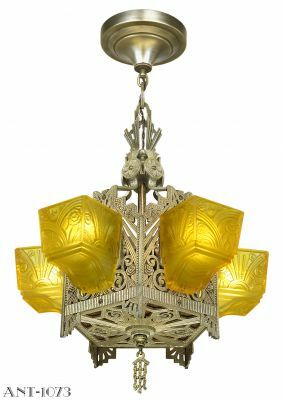 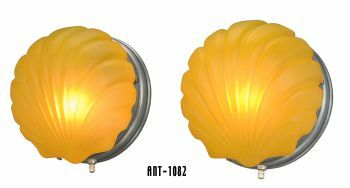 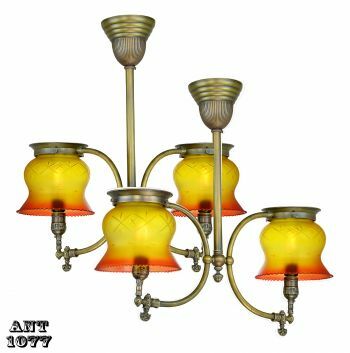 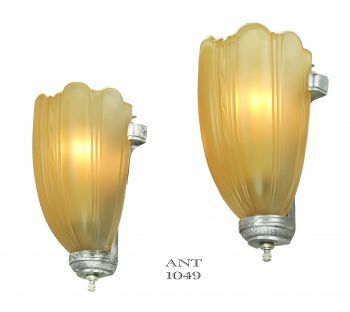 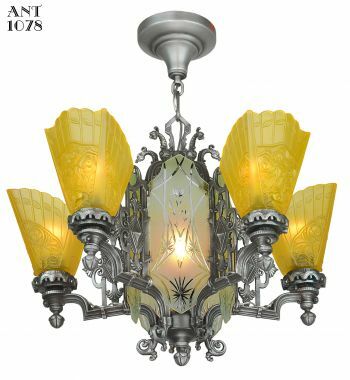 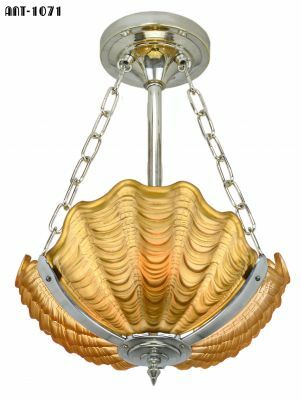 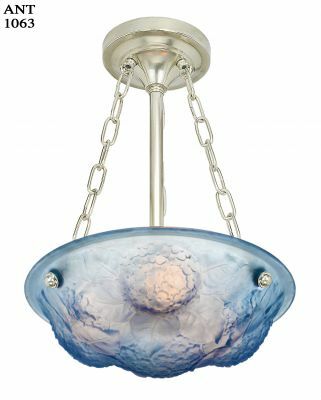 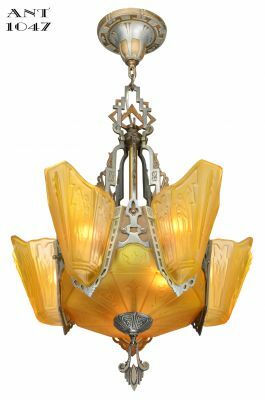 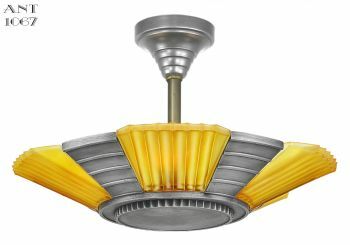 The bottom center shade was especially made for this chandelier, and was subsequently used on our matching flush mount close ceiling light. 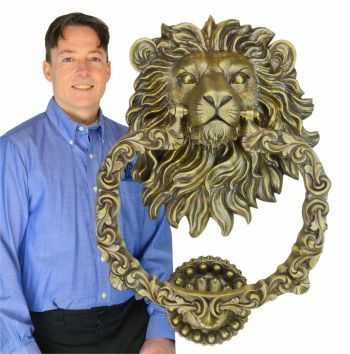 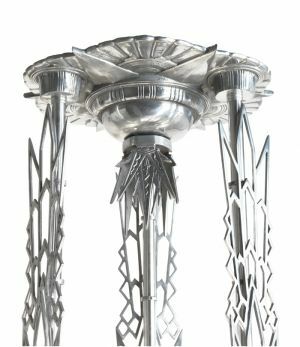 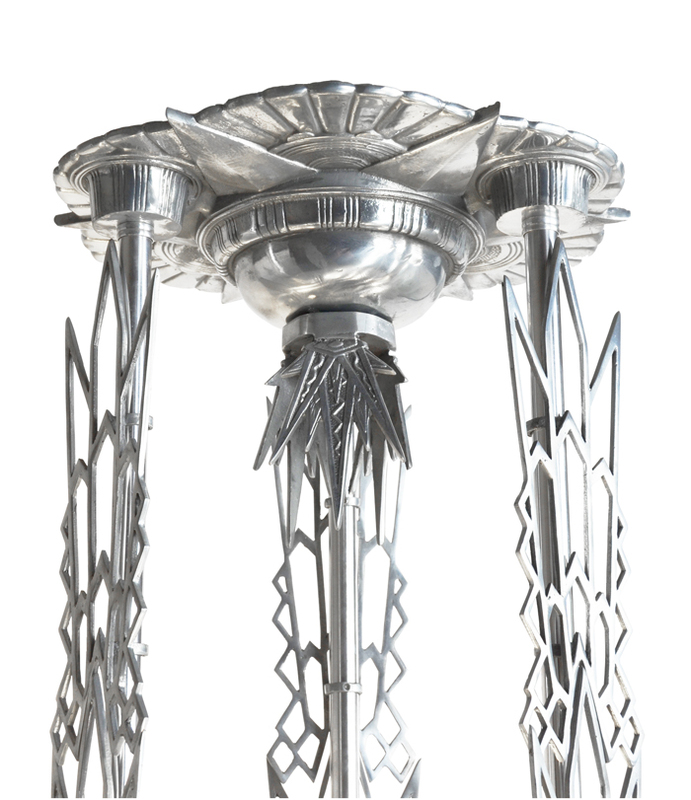 The outer bowl panels are enlarged designs of our 16"
diameter tall Manhattan and short Manhattan chandeliers for a perfect match, so large and smaller chandeliers can be used together. 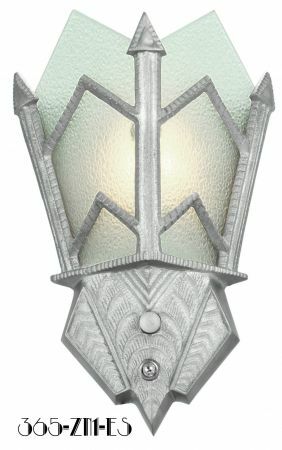 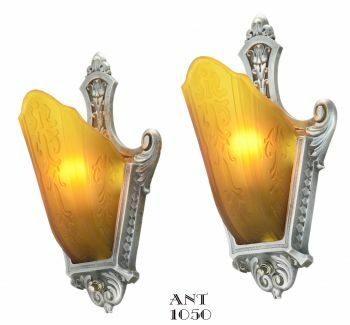 The glass panels are Deco style rough-dot design that are held in place with Nylon stops and Nylon threads to protect the glass. 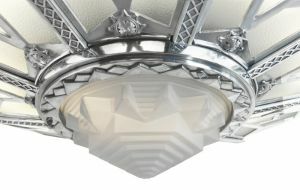 The center uprights are an elongated elaboration of the panels for a matching design. 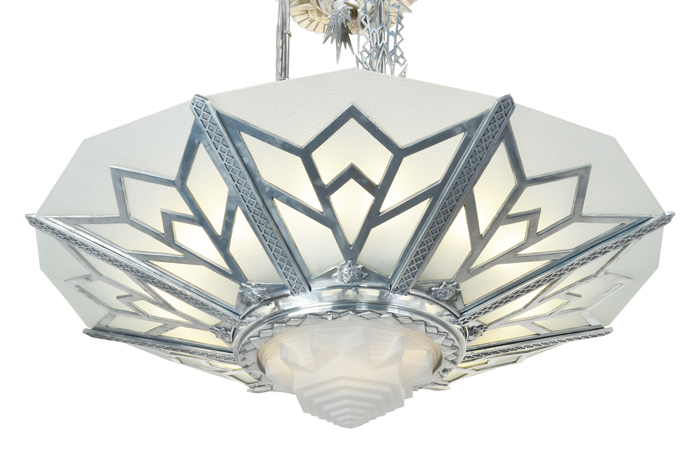 The larger-than-normal ceiling canopy makes a complete matching statement. 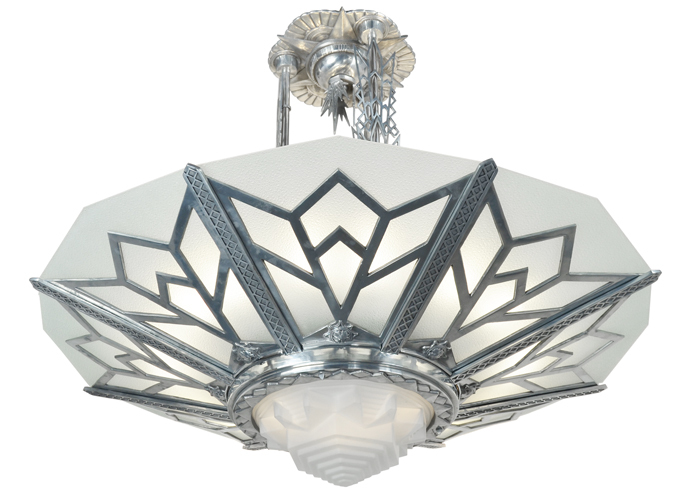 Even the 3-lobed finial is a repeat of Deco design, and also serves as the functional part that holds the chandelier to the ceiling. The bottom shade is removable by three pyramid-shaped set screws, which can be removed by hand for access to the four, 100-watt E-12 sockets. 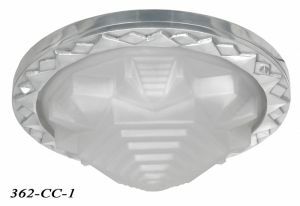 The light sockets for the eight large outer glass panels can be either E-26 medium base incandescent, GU-10 for LED, or even E-39 mogul base sockets for more powerful LED lighting. 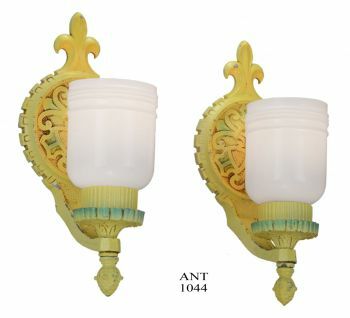 There are two sockets for each panel (see picture) and these can be either for incandescent, LED, or CFL. We are showing both LED and CFL bulbs installed in a picture. 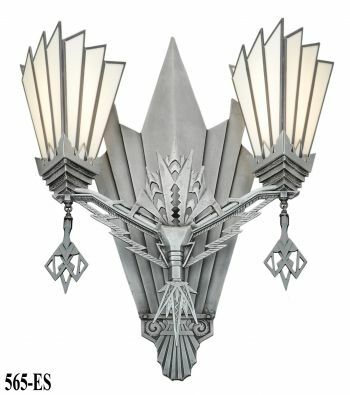 Naturally, any and all of this can be changed for the application. 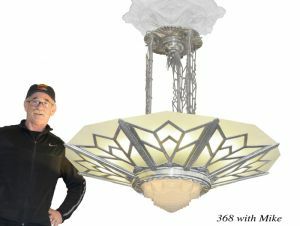 ...when officials are trying to eliminate the incandescent light bulb. 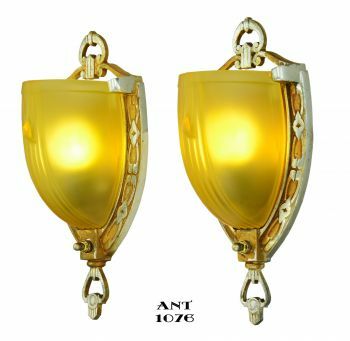 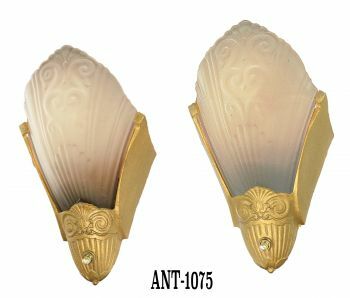 Our fixtures can comply by using the GU-10 socket or 2G11. 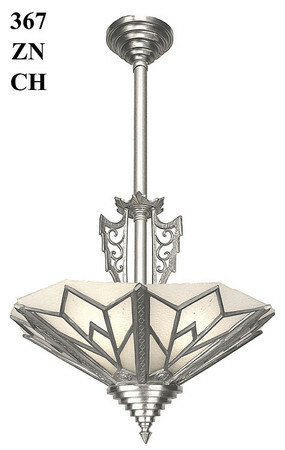 Naturally, all of our fixtures are UL approved. 2015 Kenk copyright design. 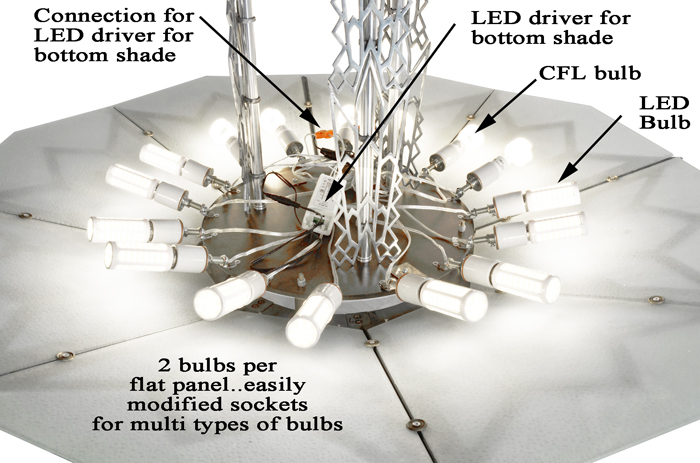 Light bulbs and sockets (for the 16 sockets on the outer panels) can be supplied in many different formats...but the standard supplied socket is the E-26 medium base NORMAL everyday incandescent socket. 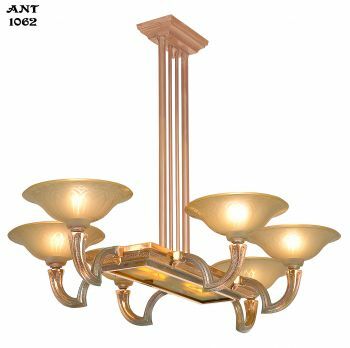 Changes and different lighting arrangements are easily discussed and made. 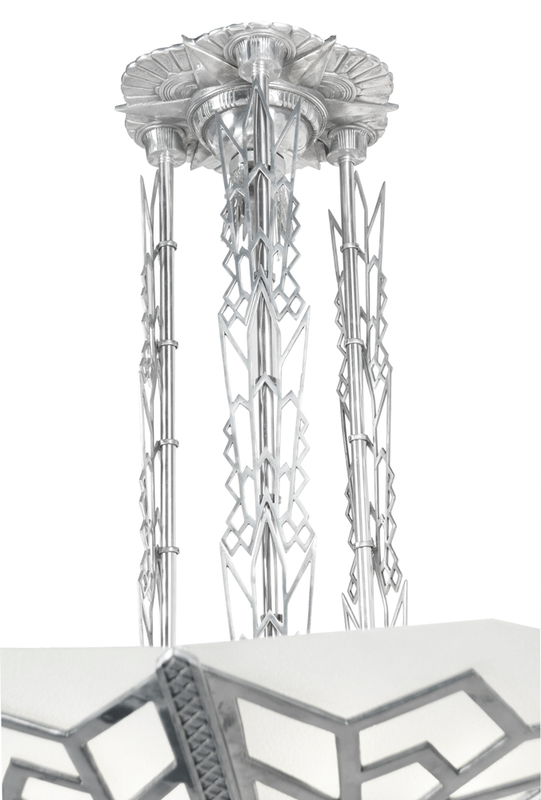 Height: 46" standard. 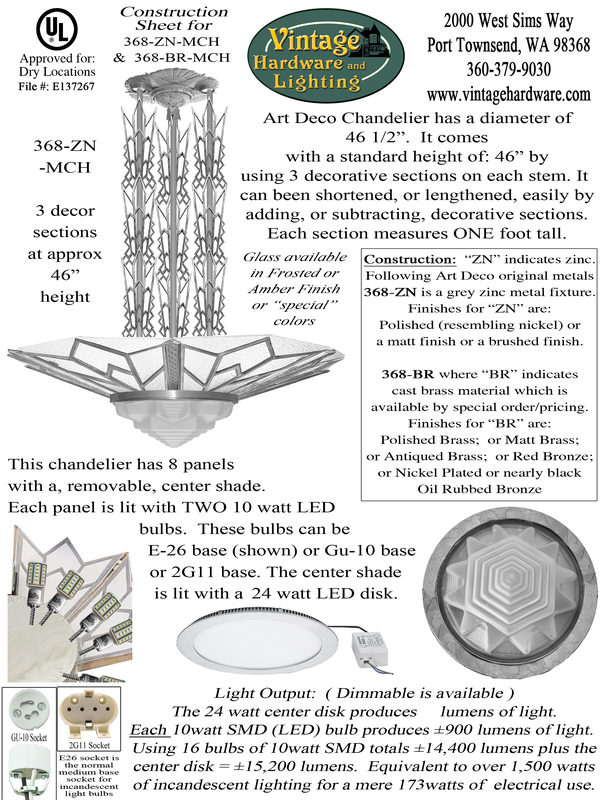 Height can be altered to fit project needs. Please contact us for pricing details.